Gillingham Ladies FC punched their ticket into the final of the FA Women’s Cup with a 3-0 win over Herne Bay Ladies FC at Chatham Town FC. 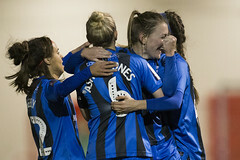 Gillingham entered the match off the back of an emphatic 2-0 win on the 13thof January, over Milton Keynes Dons Ladies FC. The Gills fielded a full-strength team, nearly identical to the one that beat Milton Keynes Dons Ladies at Chatham Town FC last week. Ellie Manning starting in the place of Sammy Booker, in the only change. 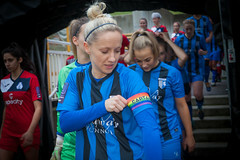 Gillingham also welcomed back Daniella Farmer, who started on the bench following over a year out with injury. Herne Bay came to the match on a good run of form, having won their last three matches, scoring 9 and only conceding 1. 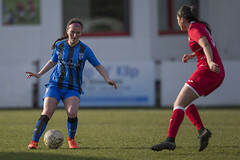 The Gills also welcomed back midfielder Lauren Williams, who used to play for the Gills Ladies, in her first appearance against her former side. The last time the two sides met was in last season’s FA Women’s Cup, where the Gills came out winners in a rampant display featuring a hat trick from Jenny Newman, a brace from Esther Anu, and goals from Jade Keogh & Bethany Nugent, as well as an own goal from Herne Bay. The Gills started off strongly, with runs on the wings from Breon Grant and Millie Waud troubling the Herne Bay defence in the opening minutes. Despite great pressing play, they were unable to find an opener in the first 10 minutes. The first goal of the game came in the 11thminute, with a great interception playing Breon Grant in past the Herne Bay defensive line. Grant’s shot was palmed away, but Alice Bussey secured it with a tap-in from short range. Following this, the Gills were firmly in the driving seat, and Herne Bay were struggling to get a look-in; when they did, it was almost instantly shut down. In the 16thminute, a corner conceded by Herne Bay was whipped in by Lauren George, but was palmed out for a corner. The second corner was more successful, meeting the head of Lydia Huntley to put the Gills 2-0 up less than 20 minutes into the match. Herne Bay started to get more of a chance to play football after this, with winger Abigail Duff making the Gills back line work to keep her off the scoreboard. Herne Bay were able to register a couple more shots and half-chances, but Gillingham were dominating in possession and had a few shots of their own that could have gone in. 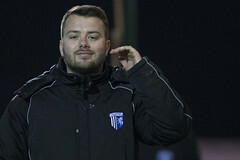 A free-kick late in the first half was easily picked up by Courtney Shanly, and the Gills entered half-time 2-0 up, but rueing the missed opportunities that could have seen them guarantee a win in the first half. In the opening few minutes of the second half, both teams were evenly matched, with Gillingham only slightly on top. A couple of Gillingham chances were answered by Duff, who released a shot from 15 yards that went just wide following a diving save from Shanly. Gillingham saw a flurry of chances after this, with shots from Bussey, George and Waud keeping Herne Bay on their toes. Around 70 minutes in, Jack Wheeler elected to make two changes, with Breon Grant and Grace Seely making way for Farrand and Farmer. Herne Bay’s Sarah Cooper was called upon to make two commanding saves from corners late on, but with the last kick of the game, Maddison Farrand bundled in a shot from Niamh Jestin to make the final score 3-0 to the Gills. 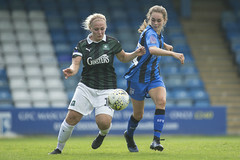 Gillingham Ladies will face Gillingham Ladies Development in an all-Gills final, with the date and venue to be decided.